The prevalent spirit at work today in the world is the spirit of deception. Many are under the influence of it without knowing, because we are in a time where lots of people are doing everything in their power to be loved, accepted and celebrated. Even many in the church have submitted themselves unconsciously because they have got to keep up with the ‘Joneses’.Some have opted to living a lie, they lie about almost anything, this ranges from the mundane to very important things. If you want to live above the evil of the day, you must begin by telling yourself the Truth at all times. 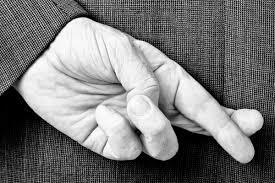 You can’t deceive a man that has not lied to himself, because for deception to take root it must have been given room. Secondly, you can’t afford to walk like the foolish. You must feed your heart with God’s word and other relevant information about life. You have to broaden your scope of knowledge of various subjects and diverse issues in life, because where your knowledge ends deception could begin. Many have been deceived in business which has made them lose huge sums of money, lose quality relationships and destroy great businesses just because they didn’t seem to know more about what they are venturing into. In addition you must seek counsel from people that are wiser, and more experienced. Talk to your mentors, your seniors and elders. Glean from their wealth of knowledge and save yourself from unnecessary disappointments. But beyond all this, is the need to seek God for direction and listen to the promptings and instructions of his Holy Spirit always. There is a limit to human knowledge but there is no limit to divine knowledge. There are certain levels of deceit that requires God’s Spirit uncovering them for you to know what you dealing with. If Satan can transform himself to an angel of light, it means one needs higher light to reveal the darkness invisible to the natural eyes and senses and this can only be given by God. Our options today have gone beyond good and bad , it now includes good, bad and God! Because what the world/society calls good today might not necessarily be GOD. This means that more than ever before God will have to guide your choices and you must rely on him consistently because there is more to what your eyes can see and your ears can hear. Think on these verses today.